Let’s be honest. None of us enjoys doing Burpees. If you have ever been in an exercise class that involved Burpees you’ve learned first-hand why Burpees are loved by trainers and despised by everyone else. To break the Burpee habit, here’s a list of practical natural movement alternatives for those who want to change it up. And for the MovNat trainers out there, here are some natural movement options to keep your classes fresh and interesting. Burpees can be performed in tight spaces – It‘s a bodyweight exercise, and therefore, can be done without equipment or set up. The exercise is a simple, effective, and portable way to ramp up your heart rate and work a full-body worth of muscles. Burpees are great at ramping up your heart rate in a short amount of time – In a small space, you can achieve the effect of sprinting up a hill. This makes Burpees perfect for getting that desired metabolic conditioning effect. Burpees are considered by many to be “functional” (which we will examine in more detail in a minute) – The functionality, in theory, is that it consists of having a person move from standing to getting down onto the floor and then back up again. Now, let’s take a look at some reasons why you might want to avoid Burpees as an exercise or at least some good reasons to try some new variations on your usual routine. I have experienced this first-hand a few years ago. Each Burpee was a compressive flexion load on my spine that just wasn’t comfortable. As a practicing Physical Therapist, I can attest that Burpees are the culprit of many exercise class injuries. Burpees can cause pain, and I don’t mean the “feel the burn” good type of exercise pain, but the more nagging, pinching, “oh no something is wrong” kind of pain. Burpees require deep hip range of motion and quick plyometric transitions between movements which means that either through inflexibility, lack of awareness, or too much emphasis on speed, it’s a recipe for joint alignment compromise. People can hurt their knees, their backs, their shoulders and necks, the list is extensive, and many people stop participating in their group exercise class because of injuries from this one exercise! If you are experiencing pain during a Burpee, please stop, talk to your class instructor and explain that you may need to try something different so you don’t continue to hurt yourself. If you are the class instructor, you may want to substitute Burpees for some more practical movements to give people some different options if Burpees are causing discomfort. I couldn’t do them in a group exercise class for a long-time due to discomfort and felt like I had no alternatives to draw on. Enter Movnat. Now I feel that I have many more natural movement patterns to practice, which are much more interesting and comfortable to practice than Burpees. The word functional sounds nice when it comes to exercises, but not all movements that are called “functional” truly fit a real-world purpose. 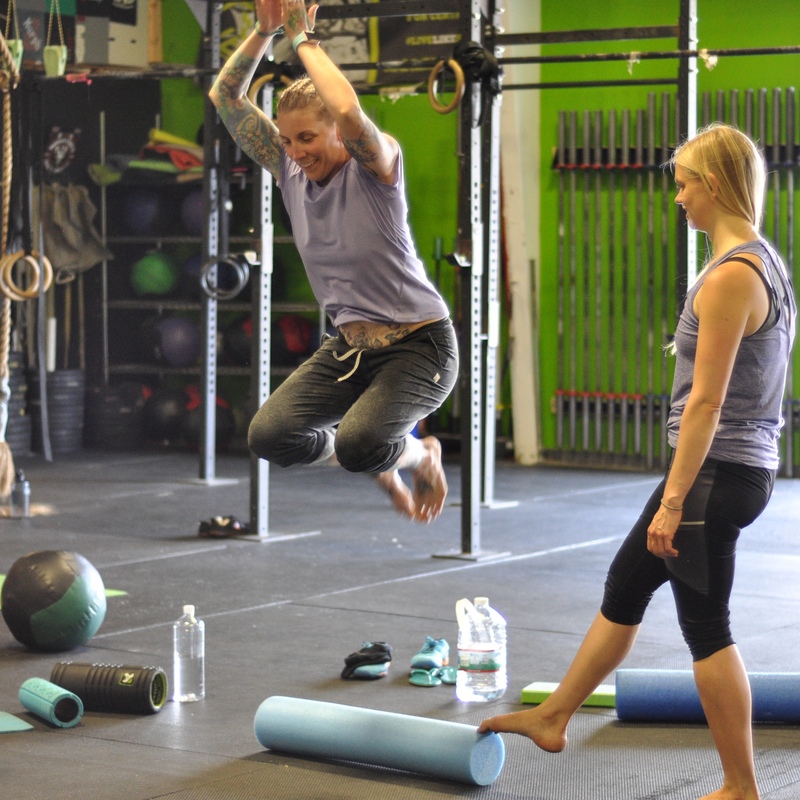 A “functional movement” may not in fact be the most efficient way to accomplish a task. Movnat focuses on practical efficient movements. Which means that movements we practice are suited for real world situations and are exactly what you need to accomplish whatever task life throws at you. Within the Movnat system we learn plenty of variations for getting up from the floor, any of which is more likely to be used in day-to-day life than a Burpee. The motion of a Burpee isn’t very practical. I wouldn’t use that motion to look into low cabinets, or to lower my body weight onto the floor to pick up my child, or get off the ground quickly to chase after a runaway pet. 3) Variety is the spice of life! Sometimes it’s just nice to do something different. It keeps a class fun and interesting and can present a new level of challenge when you’re in a rut. On a more specific note, variety of motion keeps our bodies healthy. Our individual parts need to be moved to receive nutrition. (See Katy Bowman’s work for more details) Also, more variety of movement keeps more areas of your body strong, flexible and adaptably prepared to move. More variety of motion leads to more variety in parts of the body kept healthy and ready for a variety of movement challenges. Practicing the same movement over and over without ever changing it up is a recipe for boredom and injury. Furthermore, it just doesn’t prepare us for the mixed bag of challenges that life throws at us. Choosing a way to move that aligns with your goals is important. After all, why did you choose to do Burpees in the first place? If you didn’t choose them but your class instructor did, then what did they want to accomplish with that exercise. Many people choose Burpees for the reasons we listed above, but a lot of times it is just out of lack of knowledge for different options that might serve the same purpose or even be better. There is a deeper discussion to be had on whether we should just be interested in movements for purely for what effect you can get from them versus more of a focus on moving more efficiently and enjoying the effects that come. Sort of like only being interested in oranges for the vitamin C that you can extract from them versus enjoying the whole orange. Either way, there are ways to get some of the desired effects from the Burpee with more natural movement alternatives. If you’re interested in a metabolic conditioning exercise that doesn’t take up a lot of space try a jumping pattern. If you want a practical movement that prepares you to get on and off the floor quickly try a Get Up variation. If you want a movement that gives you both upper and lower body work you might consider crawling. Take a look at the suggestions below to see how some of these natural movements might be a better fit for what you want to accomplish. Now that you’re interested in trying something new, here’s a list of more practical natural movements that just might scratch that Burpee itch. The Tripod Get Up is probably the most easily taught and practiced Get Up variation. From patients post total knee replacement to mothers who want to get up from the ground after playing with their kids, the Tripod Get Up is the most accessible get up for people in any condition to be able to perform. That doesn’t mean it’s an easy task and that you won’t get a good sweat going while doing it. Chances are, if you had to get up and down from the ground right now without thinking you’d use a Tripod Get Up. However, that doesn’t mean that you can do so with good form, efficiency, and ease. Working on the mechanics and quality of such a frequently utilized movement is invaluable to improving the health of your body, and the ease with which you can perform day-to-day tasks. The bonus, of course, is the physical conditioning you get from practicing this movement. Burpees involve good physical conditioning, but have little practical carryover into real life. Plus, they can compromise structural alignment in unproductive ways. Whereas the Tripod Get Up accomplishes everything you want; it’s good for physical conditioning, it’s a useful movement that carries-over into many real-life situations, and allows you to practice good alignment and positioning with floor to stand transfers. So, if you’re keeping score that’s a 3 to 1 win for the Tripod Get Up! Want to improve the transitions between your movements? Not all movements easily transition together efficiently. Some movements flow easily like poetry and some fit together like a jumble of incoherent letters. A Burpee consists of a squat which then transitions into a push-up position, a transition that is difficult to perform and seems awkward to use in practical situations. Squatting gets your hips low, but it isn’t an easy position to transition to get your hands onto the floor without resulting in significant spinal inefficiencies. The other problem is that in a deep squat, your ankles, knees, and hips are all closely compacted towards each other, and therefore, it is added motion and added difficulty to then transition from that compact lower leg alignment to legs being stretched out straight in a push-up position. Transitioning from a squat to kneeling or to sitting is much more efficient and logical. Switch the squat for the hip-hinge and the push-up for a hand-foot crawl position and you boost the ease and practicality of your movement transition. Try out a much smoother transition by starting with a hip-hinge (aka deadlift) and then placing your hands on the floor and begin walking out into a hand-foot crawl position. If the goal is to get your face towards the floor from a standing position, then a hip-hinge is a more natural start. In a hip-hinge you fold forward from the hip joint to allow your arms easier access to the ground. In some circumstances, this is helpful to pick up objects. But in this case, it’s to give you two more points of contact with the ground for a more efficient transition to being face-down on the ground. From the hip-hinge, now with your hands on the ground, you can begin walking out by bending your knees and coming into a hand-foot crawl position. Obviously, you reverse to come back up into standing. And for those worried that you’re missing out on the core and arm conditioning of the push-up, you only need to try holding a hand-foot quadruped position for a short while before you become a convert. If you’re insistent in the idea of going from standing to a plank position as quickly as possible then what you really want is called a Sprawl. Sprawling is the real-life equivalent of the Burpee. When a martial artist, wrestler, firefighter, police man or woman needs to get down quickly, what they use is a Sprawl. In action movies when someone yells “Hit the deck!” the heroine doesn’t drop down into a Burpee, heroines Sprawl. You start standing up and then jump your legs backward and reach both hands for the ground landing with four points of contact essentially simultaneously to cushion the impact. It’s an athletic move, to be sure. Unlike the push up position, in a Sprawl your arms and legs should be wide for a more stable base of contact. To get back up from the Sprawled position, bend your knees to transition from fully stretched to a Hand-Foot quadruped position and then look at that you can walk your hands back and hip-hinge your way up. What’s that? You want an option for more speed? Ok, got you covered. The Single Leg Get Up is a strength movement that is difficult to master. So, here’s a more accessible movement option. Start laying on your back and roll backward diagonally from one hip to the opposite scapula and use momentum to rock back up into a low compact split squat position and transition back up to stand. The practical use of this movement is to get you up and down very quickly, from lying on your back to standing. Practicing the diagonal rocking and using momentum is the first building block to working on more dynamic movements rolling. The momentum rocking upward also allows you to work on that single leg get up strength. This movement combo is just fun to do. But don’t be fooled! Your legs and core will be working hard. Instead of thinking down, why don’t we think up! Jumping is a great way to build practical skills while getting that cardiovascular punch. You know most of the drill here, but there’s a few MovNat trade secrets that take jumping from a standard playground movement to a highly efficient and honed skill. First, bend your knees and swing your arms behind you for jumping preparation then launch upward as you swing your arms, this is the part you might be familiar with. The next few bits are important. Pump your arms back and then forward one more time while you are in the air so that as you land your hands are coming forward. This does a few useful things. First, it assures you have a counterbalance in front of you so that you can bend at the hips to cushion your impact. And second it allows you to fully harness the body weight transfer and momentum of your arms as you try to hit those precision landings. What good is jumping skill if you can’t land on what you’re aiming at? Speaking of landing precisely, the final piece of the puzzle is to land with the balls of the feet hitting the ground first and bending the hips and knees to cushion the landing. Now, if you want to have a little extra fun with jumping, there are plenty of variations and add-ons to challenge your skill. Try jumping to a small landing area, a 45 pound barbell plate on the ground, or a narrow beam. Try jumping multiple times in a row to build that right body weight transfer timing and sequencing. If you really want to get fancy, jump off a raised surface like a plyo-box and cushion your landing with both your hands and your feet in what is called a slap landing. This is a higher level skill, so be careful and consult with a qualified MovNat certified trainer to guide you through the specifics. If you remember back to our discussion of why you might pick a Burpee as an exercise, I think you’ll see that all of our alternatives check the same boxes. These movements get your heart-rate up, build leg and core strength, and are easily done at home or in a small amount of space with no equipment necessary. The added benefit that natural movements have is that they are more practical and help you refine movement skills that may be useful someday. Whereas a Burpee is rarely, if ever, seen out in the wild. Now that you have some new ideas to add to your home or group class workout routine try adding in some of that natural movement flavor and see if it spices up your normal routine. Don’t suffer your way through a routine you don’t enjoy. Instead, practice skills that are immediately practical and, in my humble opinion of course, much more fun than a regular old Burpee. 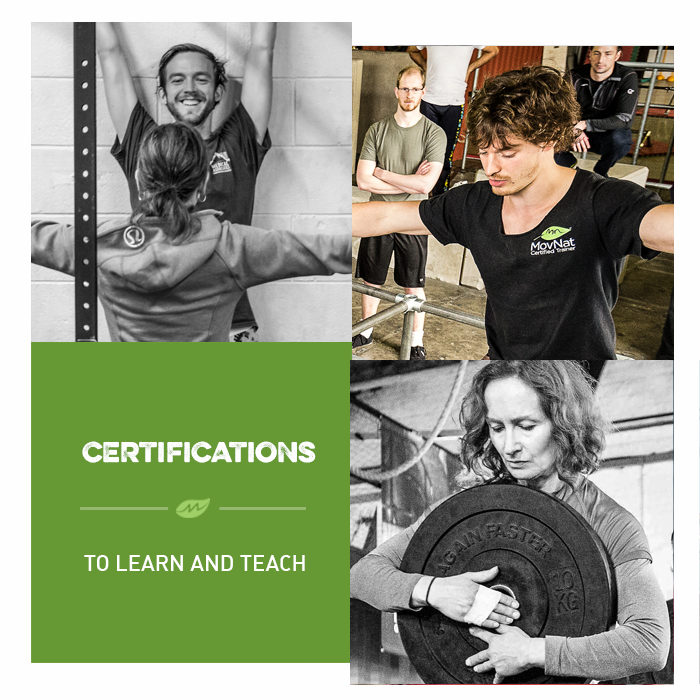 If you’d like to learn all about natural, practical, adaptable, efficient movement, join us for a MovNat Level 1 Certification or a MovNat Workshop. We hold events all around the world. Or, find a MovNat Certified Trainer or Gym in your area. We also offer MovNat Online Coaching as an alternative to live instruction and a Natural Movement Fundamentals E-Course.